I will make a somewhat startling admission: I am a faithful viewer of “Here Comes Honey Boo Boo.” To redeem myself for this indulgence, I will say that my interest in Honey Boo Boo comes not only from its entertainment value, but also its important cultural relevancy: Having grown up in the South and frequently shopping at Wal-mart, I encounter these sorts of characters every day and I enjoy the opportunity to see their lifestyles up-close and personal on television. That being said, “Here Comes Honey Boo Boo” is the only entertainment show I watch on cable television, as Netflix is my go-to source for entertainment. One of my favorite shows is the original, black-and-white Twilight Zone series. Although I love Twilight Zone for its entertainment value, I find that this series (like Honey Boo Boo) has important cultural relevancy. The series lasted for five years – starting in the late 1950s and ending in the early 1960s. This era is certainly evident in the themes and conflicts of the episodes – the struggle for individualism, the strong anti-authoritarian government sentiment, and the destruction of war. I mention the Twilight Zone because it makes me think about the cultural phobias which manifest themselves in our modern media – the lone gunman, terrorism, and religious extremism. As a US American, I cannot stress the cultural impact which 9/11 has made on my country’s population. I know that it has made a tremendous impact on me and the way I view the world. When I was young, my parents took me to the restaurant, Windows on the World (on the top floor of the North Tower.) Subsequently, watching the towers collapse on the television screen felt like a violent and personal attack. I had no idea that there was a country named Uzbekistan before I started researching it in order to purchase a book for the Global Book Challenge. 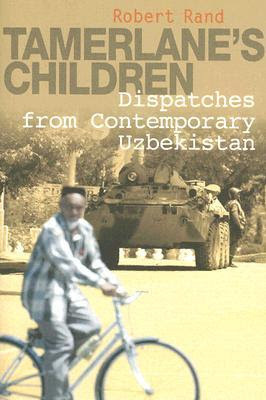 When I started reading Robert Rand’s “Tamerlane’s Children: Dispatches from Contemporary Uzbekistan,” I was surprised at the interest level and quality of the book. The author lived in Uzbekistan for several years, working as a journalist as his wife worked in the nation’s capital of Tashkent as a United Nations employee. His cultural insights are really fascinating and perfect for anyone wanting a brief introduction to the particularly current issues facing this country, and even the Central Asia region in general. Despite being consumed with studies, I devoured the book in two days. I will particularly focus on two topics of which I found to be of considerable interest: government and religion in Uzbekistan. According to the author, the government takes on an authoritarian role, as citizens are unable to even criticize the President. Human rights are of utmost concern to the international community – it was this issue which deteriorated the relationship between Uzbekistan and the United States. In May 2005, government forces killed as many as 500 protestors in the Andijon Massacre. The summer of 2005 was marked by unprecedented violence, as Uzbek citizens tried to bring about change to power, similar to the way neighboring Kyrgyzstan had toppled the regime of Askar Akayev earlier that year. Another interesting topic discussed in the book is that of religion. Uzbekistan is over 90% Muslim, but religious freedoms are limited by the state. Uzbekistan has a strong Muslim heritage and is actually the resting location of the oldest known copy of the Qur’an in the world. However, life under Soviet control had its impact, and the political atmosphere has not allowed the return of religious freedom. In short, Uzbek citizens are forced to live in a secular, Islamic world. To bring this post full-circle: I would venture to argue that a cultural phobia in the United States is that of religious extremism. We applaud secularism in the Muslim world. However, do we promote and applaud secularism to the point that it diminishes the importance of religious freedoms? How do we, as citizens of a nation fighting religious extremism, reconcile our own fears of extremism and our nation’s role of the defender of rights? Uzbekistan? Never heard of it until now! I love learning new things so I cannot wait to give this a try! Absolutely splendid!